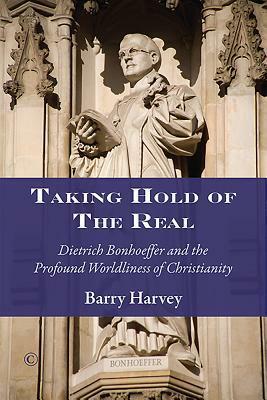 Barry Harvey, Taking Hold of the Real: Dietrich Bonhoeffer and the Profound Worldliness of Christianity, James Clarke & Co, Cambridge: 2016, xiii + 342 pages, £21.50, pbk. The subtitle of the book indicates a book in two minds, or at least with two distinct emphases. One focus is the theology, in particular the late theology, of Dietrich Bonhoeffer. The other focus is ‘the profound worldliness of Christianity’ not simply as Bonhoeffer met it in 1944/5, but the ‘worldliness’ of the world in which Christians today live, work and think. The first focus has intrinsic interest: Bonhoeffer’s prison letters are brilliant, provocative, enigmatic and challenging, and competent exegesis of them is welcome. But Harvey explores Bonhoeffer’s theology in order to prepare the way for his own thoughts on faith now, making his exegesis penultimate to the ultimate challenges of making better sense of the world Christians and others call home. Periodically, Harvey spells these twin purposes out, telling us that addressing ‘the historical connections … requires that I go on and go further with regard to the questions [Bonhoeffer] raises… for though he has significant things to say… he does not provide anything like the detailed analysis’ needed (p. 182). This approach is taken to a number of discrete features of the contemporary world discerned by Harvey (the ‘world come of age’ as Bonhoeffer described it without, Harvey thinks, resignation, approbation or apologetic intent). Most chapters then follow a pattern of introducing a topic in conversation with Bonhoeffer, gathering some sense of his take on them as a steer, and then moving beyond him to discussion of the topic at hand and to Harvey’s own proposals. Topics tackled include the aptness of describing the world as ‘come of age; the illusion that technology creates of human control of the world; the consequences of configuring the world according to binary oppositions such as secular/religious, public private; the consequences of post-modern approaches to ‘culture’ and the ‘social economy of whiteness’. Bonhoeffer is used to show how the ‘world come of age’ sees itself, but also to point the way to other, truer ways of seeing just what’s going on. Concluding chapters treat the relation of Old and New Testament in Bonhoeffer’s hermeneutics (an interruption to the flow of argument?) and move towards a conclusion with a eulogy for ‘polyphonic living’ in the world, properly construed. That proper construal turns out to be a post-liberal, non-sectarian, small ‘c’ catholic ‘this worldliness’ that refuses either to flee into the ‘other-worldly’ or to seek to change the world into God’s kingdom on earth (which is God’s business, not ours). There are a few stylistic ticks, including the occasional ‘bricolage’ use of citation after citation (so and so says… so and so says), and some puzzling omissions (e.g., of Ralf Wüstenberg’s unmissable 1998 monograph A Theology of Life). But Harvey’s book is a model of how to make use of one important way of reading classic theological texts. What makes it so good is the rare combination of critical, (i.e., textual and contextual) expertise andcreative, contemporary theological questioning and provocation. There are plenty of books doing one or the other – few do both.